Every kid wanted a doll, a Barbie doll and maybe the old classic 1915 a Raggedy Ann doll, which is a classic doll for any children. You the parent might even get one for Christmas this year for your child, but never name the doll Annabelle. A mother purchased an antique Raggedy Ann Doll from a hobby store. The doll was a present for her daughter Donna on her birthday. Donna, at the time, was a student in college, preparing to graduate with her nursing degree and resided in a tiny apartment with her roommate Angie (a nurse as well). Pleased with the doll Donna placed it on her bed as a decoration and didn’t give it a second thought until a few days later. Within that time, both Donna and Angie noticed that there appeared to be something very strange and creepy about the doll. The doll apparently moved on its own, relatively unnoticeable movements at first, like a change in position, but as time passed the movement became more noticeable. Like those Chucky movies from the 1990’s, but this story was real and true, and it happened in 1970’s. I am not making it up. This is a real case. Donna and Angie would come home to find the doll in a completely different rooms from which they had left it. Sometimes the doll would be found crossed legged on the couch with its arms folded, other times it was found upright, standing on its feet, leaning against a chair in the dining room. It was one of those WTF the doll was doing staring at her as she dropped the bag of grocery to the floor. Several times Donna, placing the doll on the couch before leaving for work, would return home to find the doll back in her room on the bed with the door closed. Donna and Angie thought someone was pulling a practical joke on her, or being punked in sort of way, even though her apartment was locked with all the security she had. She was baffled and being freaking out of why the doll would move and posing in different position. Apparently, the doll not only moved, but could write too. About a month into their experiences, Donna and Angie began to find penciled messages on parchment paper that read “Help Us” and “Help Lou.” The hand writing looked to belong to that of a small child. The creepy part about the messages was not the wording, but the way it was written. At the time, Donna had never had parchment paper or the type of pencil it was using. Where did it come from? One night Donna came home to find the doll had moved again, this time it was on her bed. Donna had come to find that this was typical of the doll but some how she knew this time it was different. Something wasn’t right. A sense of fear came over her when she inspected the doll and saw what looked like blood drops on the back of its hands and its chest. Seemingly, from no where, a liquidly red substance had appeared on the doll. Scared and desperate Donna and Angie decide it was time to seek expert advice. Not knowing where to turn they contacted a medium and a séance was held. Donna was then introduced to the spirit of Annabelle Higgins. The medium related the story of Annabelle to both Donna and Angie. Annabelle was a young girl who resided on the property before the apartments were built. She was a young girl of only seven years old when her lifeless body was found in the well upon which the apartment complex now stands. The spirit related to the medium whom she felt comfort with Donna and Angie. Feeling compassion for Annabelle and her story Donna gave her permission to inhibit the doll and stay. They were soon to find out what Annabelle could do. Lou was friends with Donna and Angie and had been with them since the day the doll arrived. Lou had never been fond of the doll and on several, occasions warned Donna that it was evil and to get rid it of it. Dolls are creepy. Donna had a compassionate tie to the doll and not giving much credence to Lous’ feelings kept it. Donnas’ decision, it turns out, was a terrible mistake. Lou awoke one night from a deep sleep and in panic. Once again, he had a reoccurring bad dream. Only this time somehow, something seemed different. It was as though he was awake but couldn’t move. He looked around the room but couldn’t discern anything out of the ordinary. Then it happened. Looking down toward his feet, he saw the doll, Annabelle. It began to move slowly and glide up his leg, moved over his chest and then stopped. Within seconds, the doll was strangling him, it paralyzed him and he started to gasp for air. Lou at the point of asphyxiation, blacked out. Lou awoke the next morning, certainly it wasn’t a dream. Lou was determined to get rid of that doll and the spirit that possessed it. Lou, however, would have one more terrifying experience with Annabelle. Preparing for a road trip the next-day Lou and Angie were reading over maps alone in her apartment. The apartment seemed eerily quiet. Suddenly, rustling sounds coming from Donnas room aroused fear that someone had possibly broken into the apartment. Lou determined to figure out who or what it was quietly made his way to the bedroom door. He waited for the noises to stop before entering and turning on the light. The room was empty except for Annabelle, whom was tossed on the floor in the corner. Lou scoured the room for forced entry, but nothing was out of place. But as he got close to the doll, he got the distinct impression that somebody was behind him. Spinning around he was quick to realize that nobody else was there. Then in flash he found himself grabbing for his chest, doubled over, cut and bleeding. His shirt was stained with blood and upon opening his shirt there on his chest was what looked to be 7 distinct claw marks. A marked from the demon! Donna finally was willing to believe the spirit in the house was not that of a young girls but inhuman and demonic in nature. After Lous’ experiences Donna felt it was time to seek real expert advice and contacted an Episcopal priest named Father Hegan. Father Hegan referred their case to Ed and Lorraine Warren. Ed and Lorraine Warren immediately took interest in the case and contacted Donna concerning the doll. The Warrens, after grueling over the case facts for hours came to the conclusion that the doll itself was not in fact possessed – but haunted. Spirits do not possess inanimate objects like houses or toys, they posses people. A spirit will attach itself to an object and this is what occurred in the Annabelle case. The spirit moved the doll around and created the illusion of it being alive. Truly, the spirit was not looking to stay attached to the doll, it was looking to posses a human host. The spirit or in this case an inhuman demonic spirit, was essentially in the infestation stage of the phenomenon. 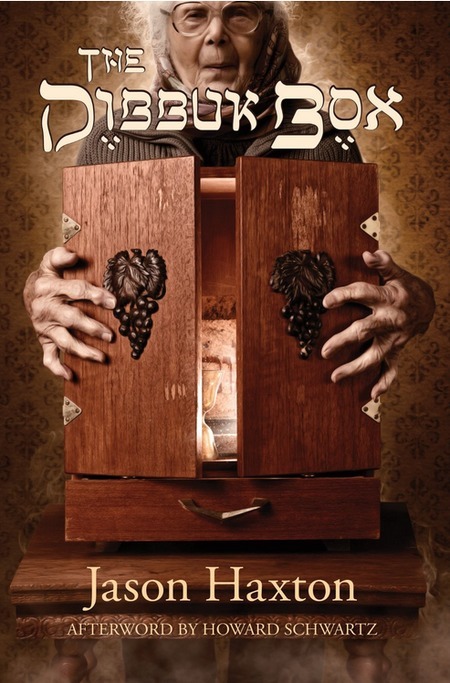 It began moving the doll around the apartment by means of teleportation to arouse the occupants’ curiosity in hopes that they would make the predictable mistake of bringing a medium into the apartment to communicate with it. Which the girls did. Now able to communicate through the medium, the entity preyed on the girl’s emotional vulnerabilities by pretending to be a rather harmless young girl with which, during the séance, managed to extract permission from Donna to haunt the apartment. In so far as demonic is a negative spirit, it then set about causing patently negative phenomena to occur; it aroused fear through the weird movements of that doll. It brought about the materialization of disturbing handwritten notes. It left a residue of blood on the doll, and ultimately, it even struck the Lou on the chest, leaving behind claw marks. The next stage of the phenomenon would have been the complete human possession. Had these experiences lasted another 2 or 3 weeks the spirit would have completely possessed if not harmed or killed one or all the occupants in the house. At the conclusion of the investigation, the Warrens felt it appropriate to have a recitation of an exorcism blessing by a priest to cleanse the apartment. “The Episcopal blessing of the home is a wordy, seven-page document that is distinctly positive in nature. Rather than specifically expelling evil entities from the dwelling, the emphasis is instead directed toward filling the home with the power of the positive and of God” (Ed Warren). At Donna’s request, and as a further precaution against the phenomena ever occurring in the home again, the Warrens took the big rag doll home with them. For the next few days, after the Warrens arrived home, Ed sat the doll in a chair next to his desk. The doll Levitated a number of times in the beginning, then it seemed to fall inert. During the ensuing weeks, it began showing up in various rooms of the house. When the Warrens were away and had the doll locked up in the outer office building, they would often return to find it sitting comfortably upstairs in Ed’s easy chair when they opened the main front door. Although the phenomenon was the same as that which had occurred in the apartment neither Lorraine nor Ed was ever physically attacked. 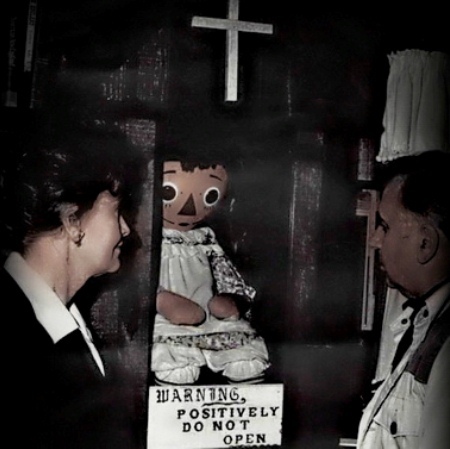 I hope you enjoyed this article and should you ever want to visit the famous Annabelle she can be found at the Warren Occult Museum in Moodus, Connecticut. 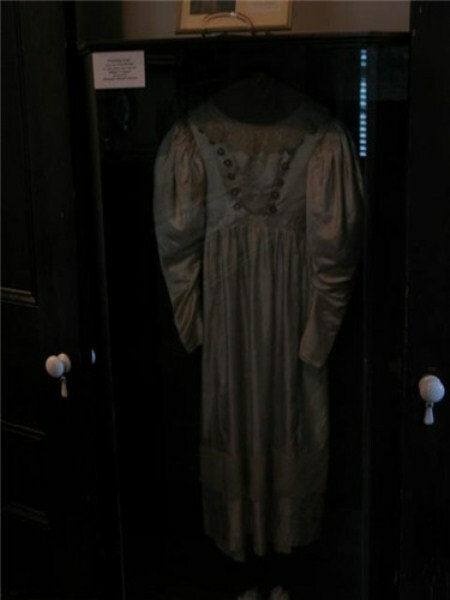 The museum is run by Lorraine Warren, the famous paranormal investigator, and now frequent guest on the television show “Paranormal State” and “Haunted Collector” on the SyFy channel. 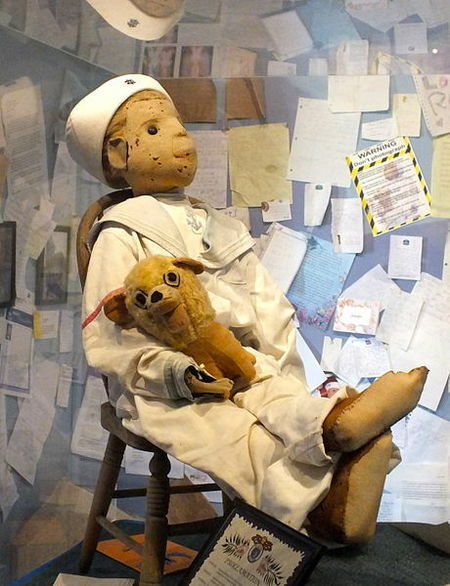 Housed in a glass case at the museum you will find Annabelle. Mrs. Warren relates that Annabelle still moves about occasionally and is still known to make growling noises at unsuspecting visitors. Update: This feature is in the movie “The Conjuring” now playing in theater. The real doll is locked in the Warren Occult Museum.